Find out what Specializations are available for one of the most iconic WW2 tanks. In Battlefield™ V, you have a host of vehicles to choose from, each with their own unique set of characteristics for offense, defense, handling, speed, and utility. In addition, vehicle Specializations add an additional layer of choice in how you want to configure your vehicle. So, what are vehicle Specializations? Unlockable by playing the game, and by spending the in-game currency Company Coin earned from doing so, they are perks which tailor the defensive and offensive capabilities of your vehicles. Help yourself and your team by unlocking these utility gadgets as you progress and invest in your Company’s vehicles. Curious about weapon Specializations? Read our article about how to improve your EMP submachinegun. You have a lot of choices to make when specializing your vehicle, and it all comes down to the tactical situations you anticipate, the layout of the battlefield, and your gameplay preferences in general. The amount of gameplay-altering choices you can make to a single vehicle, and the gameplay significance of those choices, is something we hope you'll appreciate. Specializations won’t make you invincible, though. They are designed with balance in mind and won’t create disadvantages for new players going up against players who’ve already put in hundreds of game hours. Vehicles have their own roles, strengths, and weaknesses – and these are true regardless of your loadout. If you’re piloting a fully-upgraded light tank, you’re still vulnerable to a squad of low-level players armed with Sticky Dynamite and Panzerfausts. Each vehicle has its own Specialization tree that fits the role of the vehicle. The Tiger I tank, for example, has Specializations that allow it to become more efficient at fighting enemy armor. The Staghound T17E1 armored car can be specialized into an excellent flanker and recon vehicle for the team. 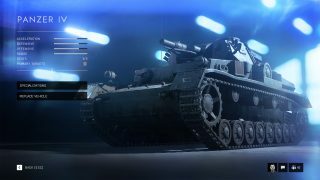 Just as visual customization of vehicles (coming post-launch to Battlefield V) won’t change how a vehicle performs, most Specializations do not change how the vehicle looks – but there are exceptions to the latter. For example, if you specialize a tank with Armored Skirts to increase defensiveness, track skirts will be added, so you and everyone else can see why and how your tracks have become less vulnerable to damage. To give you an inkling on how a Specialization journey may look like, let’s look at the Panzer IV, the German medium tank used extensively during World War 2. As shown in the image above, there are three columns to navigate between in your Specialization route. First, look at the four upgrades in the left column, which will be extra interesting if you want to create a tank good at fighting other tanks. Smoke Launchers: Fits multi-barreled smoke grenade launchers to the side of the turret. Allows the driver to launch smoke grenades in the direction of the turret, providing a dense smoke screen that obscures vision. Replaces the default Smoke Generator. Armored Skirts: Attaches metal plates to the sides of the hull for increased track protection, making tracks less vulnerable to incoming fire. Pak 40 L/43: Replaces the default tank gun with a long-barreled Pak 40 cannon. Improves muzzle velocity for increased range and a flatter shell trajectory. Reduces the rate of fire slightly. Armor-Piercing Round: A limited quantity shell that has increased damage and penetration versus armored targets. On the right side of the tree you’ll find Specializations tailored towards making your Panzer IV more efficient against infantry. Again, you can choose to stay exclusively on this side when specializing, or take detours to the left and middle side. Zimmerit Paste: Coats the tank in paste, which makes it impossible for grenades and mines to stick to the hull. Flare Launcher: Fits the tank with turret-mounted launchers, for launching flares that spot enemies in an area for a limited time. Replaces the default Smoke Generator. Improved Turret Transverse: Improves the turret motors for faster turret rotation, allowing the turret to easier track fast moving targets. S-Mine Launcher: Fits the tank with multiple launchers that deploys air-bursting explosives in a 360 pattern around the tank, for proximity defense against infantry. The middle column has two Specializations to offer: one which is available as your second choice, the other a perk that can wrap up your Panzer IV Specialization journey. Field Repair: Limited quantity specialized equipment for instantly fixing damaged tracks, engines, and turrets. Replaces the default Emergency Repair equipment. Case Round: Allows the tank to load a shrapnel shell for blasting soft targets at close ranges. 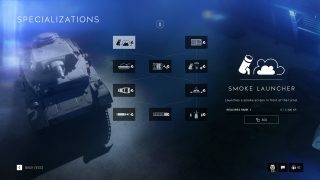 A complete Specialization journey could look like this: first, you choose between Smoke Launchers and Zimmerit Paste, effectively picking if you’ll start by specializing towards anti-vehicle or anti-infantry. Say you pick Smoke Launchers and continue down the anti-vehicle path. Next, you can pick Armored Skirts or switch over to the middle and choose Field Repair to hybridize. If not, you can continue with the Pak 40 L/43 upgrade, which is required to use the special Armor-Piercing Round. The latter can be your last choice, unless you go for the Case Round Specialization. Making your way through the entire Specialization tree is not the end. You can go back and re-spec your vehicle to try out new combinations and, coming post-launch, there will be vehicle-specific Special Assignments to take on to unlock cosmetic rewards. No matter what choices you’ll make, we hope you have fun making your vehicles special and optimal for your playstyle when Battlefield V launches. – Jonas Elfving, with help from Patrick O’Shaughnessy, Senior Game Designer, Jesper Hylling, Senior Game Designer, and Nick Baker, Game Designer.